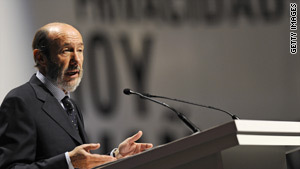 Spainish Interior Minister Alfredo Perez Rubalcaba warned that ETA could strike soon. Spanish Interior Minister warns of "kidnapping or spectacular action"
Madrid, Spain (CNN) -- The Basque separatist group ETA could be a planning a major attack or a high-profile kidnapping, Spain's Interior Minister warned publicly this week, and the government raised its nationwide terrorism alert to "level two." "A kidnapping would be a spectacular action and would bring media attention to ETA that it lacks at this time," Interior Minister Alfredo Perez Rubalcaba said Monday. He repeated the warning in a Basque radio interview on Tuesday shortly before his ministry increased the alert level. A few thousand people in Spain's northern Basque region have police or private bodyguards due to threats by ETA, which is blamed for more than 800 deaths in its long fight for Basque independence. Those who have bodyguards include many public officials, even down to the level of town councilors, and judges, as well as some business executives, teachers, journalists and doctors. ETA, listed as a terrorist group by Spain, the European Union and the United States, has carried out high-profile kidnappings before. Some ended in death for the hostages, including a town councilman; while police rescued others, including a prison guard held hostage for nearly one and a half years. Rubalcaba's unusual public warning about a possible ETA attack or kidnapping brought criticism from some in the main opposition conservative Popular Party and police officer unions. But others praised the warning as way to reinforce security for the nation. The Interior Ministry said in a statement that the level two terrorism alert "implies a probable risk of a terrorist attack." The increased alert includes more police scrutiny at transit hubs and other public places. The highest alert is level four, when armed forces are deployed against an imminent threat of attack, an Interior Ministry spokeswoman said. The ministry statement said the alert was raised to level two after reviewing police intelligence, for various reasons: the Christmas holiday season, Spain's upcoming role as the rotating European Union president for the first half of 2010, and the "persistent international terrorist threat seen in incidents like the flight from Amsterdam to the United States." Spanish media on Wednesday cited police intelligence reports that warn of two possible ETA attacks, but the warning lacks specific targets or dates when they might occur. Police this year have arrested about 70 ETA suspects in Spain and France, ETA's traditional rearguard base just across the border, officials said. That includes the arrest in October of a suspected top ETA leader, the fifth time since May 2008 that a suspected ETA chief operative has been detained. ETA, founded in 1959, is an acronym for Euskadi ta Askatasuna, which means "Basque Homeland and Liberty" in the Basque language. Rubalcaba said in a Basque radio interview Tuesday that "ETA is in a weak situation. It's been hit hard by the police and the courts. It's isolated socially, and has infighting in its ranks. In these circumstances, it's easy to predict that ETA is thinking of demonstrating that it's alive, that it exists."